DOL Takes Worker Voice Summit On The Road - CUE, Inc.
Here’s something to keep an eye on from the Department of Labor website. Officials from DOL will be conducting a series of regional events promoting the concept of the Worker Voice. Building on the momentum generated from the October 2015 White House Summit on Worker Voice, members of the administration are traveling around the country for a series of regional events in 2016. 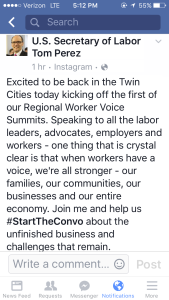 Beginning on February 9, 2016 in Minneapolis, Minnesota, these regional events will help tell the unique story of how workers, organizers, and employers are flexing their collective muscles to create positive change in workplaces and communities throughout the country. The first event was held on February 9th and featured U.S. Secretary of Labor Tom Perez who spoke to area workers, business owners, union leaders and elected officials gathered at a community center in south Minneapolis, as reported on the labor website Union Advocate. Minnesota is “ground zero,” Perez said, for successful and innovative strategies that serve as a model for workers looking to gain a meaningful voice on the job. If you are interested, you can see a lot of the meeting content on twitter under the hashtag #StarttheConvo. Previous Post Advice on Building Engagement From the Motley Fool Next Post Hot off the presses>> 2015 CUE Labor Trends Report!